British Airways is going where failures have gone before. Three London to New York business class-only airlines have already collapsed - Silverjet, Maxjet, Eos - hit by rising oil prices. But more than a year after the last one - Silverjet - went bust, British Airways is trying its own version. The new service will fly from London's City airport. That could be a key difference from its failed competitors, which flew from Luton and Stansted - not particularly convenient for those in the financial heart of the capital. And it means that high-flyers won't need to cross London to fly from Heathrow. But there is a disadvantage too. Flying from London City means the planes need to land at a much steeper angle than normal - the Airbus A318 which is being used for the new service is approved for a five and a half degree approach slope, compared with three degrees for a normal approach. It also has to carry less fuel on take-off. And that means a refuelling stop in Shannon in the Republic of Ireland. That adds time to the journey. But on the plus side travellers can clear US immigration while in Ireland - so when they land in the States they can pass through the domestic gate which should be quicker. 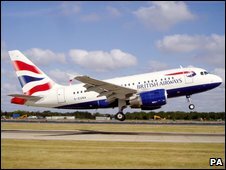 British Airways says that, once you take that into account and the fact that bankers won't have to cross London to Heathrow, the new service will actually be quicker - especially on the return leg when there's no need to stop in Shannon. The plane will carry only 32 passengers, in seats that recline to fully flat beds. That has outraged environmentalists, who say each traveller will be responsible for about three times the emissions of regular flights. And it sits somewhat at odds with the deal offered last week on behalf of the airline industry by BA's boss, Willie Walsh, for carbon emissions to be cut by 50% from 2005 levels by 2050. One new feature is the ability to send text messages and use the internet during the flight - which BA says isn't currently available on its other business class services. But passengers will have to pay extra for it - with charging on a similar basis to how roaming works on a mobile phone. Even when you're buying a £4,000 return ticket, not everything is complimentary. That price is also slightly more expensive than a more normal business class ticket from Heathrow. At first the service will be once a day - except on Saturdays when London City is closed - before increasing to two flights a day from mid-October. BA will have to make sure the service is reliable. If there were any technical problems with the plane it could mean big delays waiting for a new flight. The airline thinks it's got a winning case for a new business service and will be hoping a resurgent banking sector will provide the custom. But the economy is still struggling, businesses are trying to trim costs and some banks are worried about public perceptions of largesse after the taxpayer bail-out. That's all extra baggage for the new route to take on board. 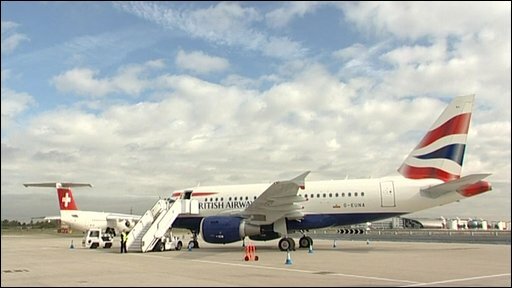 The A318 is the smallest aircraft in BA's fleet - and it's got another claim to fame too. It'll be the first plane since Concorde to carry the BA001 flight number.